Dlyn has given us Amy's link, complete with bits of her songs. Sweet! Thanks Dlyn! And I have no idea how Jenn tagged me for cool stuff. But I like it! 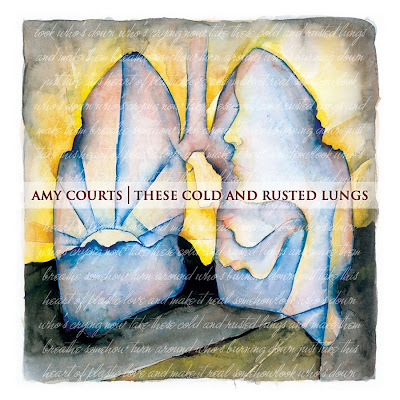 As promised, the review of Amy Court's second independent release album, These Cold and Rusted Lungs, being released "to the world on July 29th". It takes me awhile, y'all, to really latch on to a piece of music. It takes me awhile to latch on to anything, truthfully. So I expected to have to listen to this CD about a million times to determine whether or not I like it. Of course, if I hate something I know immediately. I listened to this album once, maybe twice, before it became like my tye-dyed turtleneck. Soft, comfortable, earthy, deep colors, begging to be worn often. I like it. Liked it right off. There's nothing spectacular, which pleases me. I don't enjoy vocal or musical gymnastics for anything other than a concert or show. If I'm going to listen to something till the CD melts or breaks, it has to be comfortable, warm, easy on the ears. And throaty. This album is all of those. Let me tell you a little bit about Ms. Courts. She's a young step-mother. Motherhood did not come gradually or easily, it seems. It was instant. There was no manual. Hey! Did you get a manual? I'm still looking for it. I grew my kids up from ground zero, but I know some of you can relate to instant motherhood. There's a heavy feel to the music, a crying out. Here, let me let her tell you: "Though undeniably heavy and occasionally dark, the album's message is ultimately one of abandoned hope. For those in the midst of the constant struggle to die to self so love and faith can survive, comfort comes in knowing 'these cold and rusted lungs' weary from waves of lies can always be made to breathe: and a heart made plastic by past rejection and love lost can always be made real." Tracks two and three - In You and Breathe - are probably my favorites. 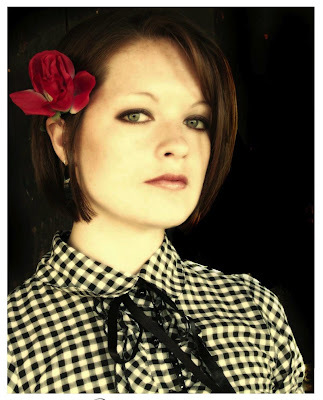 Maybelline thinks she sounds like Jacqi Valasquez (I know I spelled that all wrong). I especially love track seven. Probably because it's acapella. I have a soft spot for acapella. So keep your ears peeled in late July. Amy will be in stores, waiting for you to give her a listen. Sounds interesting...I love music like that. Alright. I'll check it out, because I trust you. And I am so glad you loved the book! It was an unusual style, wasn't it! and click on media, you can listen to some cuts from the album. I like her! How do you get these advance things you lucky wench? Thanks for the heads up...I like what I heard, and can't wait for the end of July!!! Sounds good but I think you need to post a pic in the tye-dyed turtleneck...that would be even more interesting. And yes, lemon would work. Sounds like some tunes worth listening to! Thanks for the review! I just checked out the cuts . . .pretty darned cool!